While we await for Dark Souls 2 to release in about 5 months time, I was struggling with something to post. I haven't gotten into the Beta either. So I figured hey, where's all the light hearted stuff from the game? Maybe I can put up something along those lines. That led to me going and finding this old pic I took that made me laugh and then fall to my death. 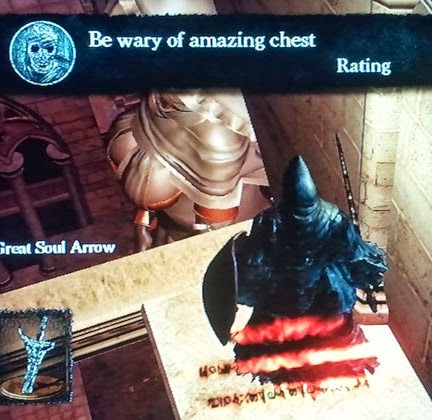 Later I found that there were like 50 of these messages covering the floor in front of Gwynevere in her chamber in Anor Londo, but I encountered this one first and, my immaturity won with a giggle. As for Dark Souls 2, I wonder if she'll make an appearance. If you manage to "kill" her and bring darkness to Anor Londo, it doesn't matter, because you find out that she is an illusion Dark Sun Gwyndolin made. The real daughter of Lord Gwyn isn't anywhere in Lordran. If I recollect- she married the Flame God Flann, and as a Queen of Sunlight she resides in another land. Could she be somewhere in the lands we soon get to explore?